Location/ Directions: Located 13.5 miles northeast of downtown Nashville and 0.5 miles northeast of downtown Goodlettsville. Traveling on I-65 North: Exit at Long Hollow Pike, exit #97 and turn left. Turn right onto Cartwright Street and the Motel 6 is visible. About Hotel: 2-Floors, 92-Rooms, Exterior Corridors,Free Local Calls, Free Morning Coffee, Free Expanded Cable TV, Kids Stay Free, Pet Allowed, Coin Laundry, Outdoor Pool, WiFi Available (fee). Railroad View: Good View.You need a room on the rear of the motel, north west wing of the building. These rooms are the only rooms in the motel to offer a railroad view. Rooms are typed in order starting with the best rooms/views. 2nd floor rooms are best: 214, 215, 216, 217, 218, 219, 220, 221, 111, 112, 113, 114, 115, 116. If you don't get one of these 14 rooms, you will not get a railroad view. Trains will be off to the left as they pass over East Cedar Street located behind the motel. Railroads past Hotel: CSX Transportation. This is the CSX main between Nashville and Chicago, IL. Expect about 25 trains per day past the motel. 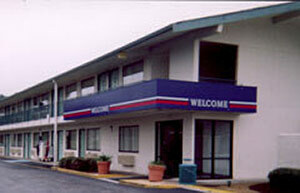 Photo Comment: The Google Map aerial view shows Motel 6 near the top of the photo. The railroad can be seen near along the bottom of the picture. It should be a clear view from the second floor rooms. First floor rooms will have to deal with vehicles parked in the parking lot.